In one of the narrow lanes of Ganesh Nagar, thousands of houses are cramped together to accommodate migratory population living in Delhi. The area, located near the Yamuna, is bustling with people looking for livelihood, education and a better life. In these dingy streets these people are crammed together, joining hundreds of others, who came to the Capital to fulfill their dreams. Deepak is one among many in the area, who aims to be a star one day. He ran away from his home in Chappra, Bihar, to achieve what he dreamt throughout his life ~ to become a Bhojpuri singer. Deepak encountered in his childhood a Harmonium lying around at his home that, he proudly says, belonged to his father, who had “ordered” him never to touch the instrument. “I was weak in studies and never enjoyed it,” Deepak recalled. “But I never missed school on Saturdays because it was only the time I would get a chance to sing in the music class.” A few years later, when Deepak became more determined about his ambition, he ran away to Delhi. Raj Studio is located in a tiny basement of one of the apartments in Ganesh Nagar. The basement is divided into three even more tiny rooms. This is one among the hundreds of Bhojpuri music studios that line the streets of several localities in Delhi, including Laxmi Nagar, Ganesh Nagar and Badarpur. One room is the recording booth, where the artiste sings the song, the second room is the editing studio equipped with heavy speakers and other sophisticated audio devices. The third room is meant to be an office to host people waiting to record their songs at the studio. Every day the studio encounters dozens of teenagers, who wish to record their songs and “become a star”. The footfall is the maximum on weekends as most aspiring singers are working somewhere and are free only on weekends. The studio has been home to Deepak since the day he entered it. He is engaged throughout the day writing lyrics, directing the singers, meeting other aspiring artists, who frequent the studio. The monotony only breaks when Deepak visits the temple or goes out to have lunch. Quite often, Deepak also sings Bhojpuri songs. 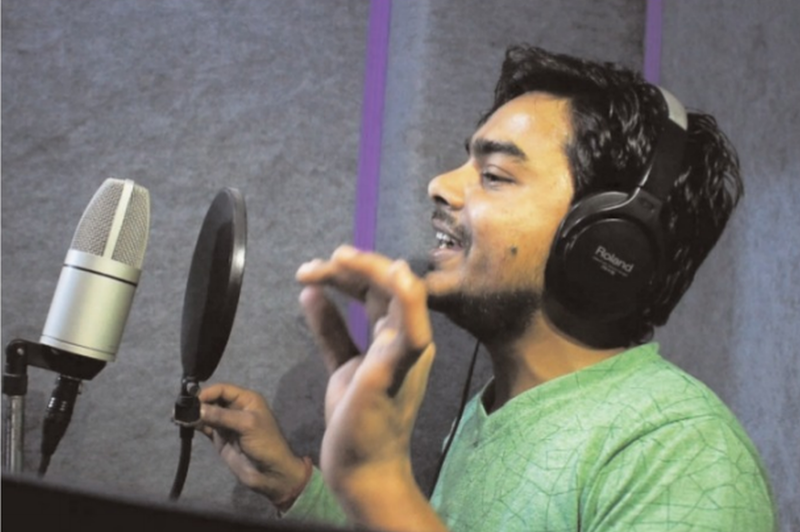 There are more than 200 Bhojpuri music studios in Delhi that attract aspiring artists from Eastern Uttar Pradesh and Bihar. These studios witness hundreds of footfall daily, majority of them teenagers, who share a common dream. According to D N Mishra (? ?WHO IS HE??) most of the studios are concentrated in Ganesh Nagar, Laxmi Nagar and Dwarka. The entertainment industry in India, especially Bollywood, has produced several stars with a huge fan following all over the country. Over the years, the industry has seen a list of superstars, who are famous not only in India but world over. Fame, fans and wealth are associated with stardom and many an aspirant dreams of reaching this top slot. This desire, especially among local artists, has over time led to the emergence of several regional entertainment industries running parallel to Bollywood ~ Punjabi, Bengali, Assamese, Marathi, Tamil, Telugu and Malayalam to name just a few. In this, Bhojpuri film industry in Bihar and eastern Uttar Pradesh is a lively segment with quite a sizeable fan following of its own. Enjoying equal popularity is the music emanating from this region. Unlike Bollywood or other music industry, Bhojpuri music is mainly driven through video platforms like Youtube. The entire industry has shifted from cassette tapes to online digital presence. The success and profitability is measured by the number of views and likes. Videos touching million views, for instance, are not only considered successful but also a source of enormous revenue for studios producing them. One such studio is Sanjeevani studio, based in Delhi. The virtual presence of the studio on Youtube drives its revenue. With over three million subscribers, some of its songs have viewership of more than 50 million views, considered exceptional according to digital standards. Apart from the revenue from advertisements, some artistes argue, the digital presence has “democratised” the industry. Earlier, the music industry would circulate the songs in CDs or cassettes. It was an expensive process. Also, the circulation was limited. Today, the music industry has shifted to digital space, where there is no constraint. Unfortunately, there is a flip side to this flourishing business. In the fight for views and subscription, vulgarity has become the motif in this industry. This is visible in the misogyny and sexist overtones. In a bid to gain traction the Bhojpuri music industry has started to cater to a niche audience, where it sells the vulgarity along with the music. Regretting the deterioration, Deepak, however, said, “No lyricist would ever want to write vulgar music, but if the public wants those songs how can we avoid it?” Therefore, the onus of vulgarity isn’t just in the hands of those who make the songs but those who consume it and create a demand for further songs, the artistes assert. The Bhojpuri industry has produced stars like Manoj Tiwari and Ravi Kishan, who have transcended the industry and earned a name beyond the Bhojpuri industry. The rise of these stars has led teenagers from across class and small towns to aspire for this top-spot. The industry is increasingly seen as an alternative to Bollywood, being cheaper, more accommodative and less competitive. When asked about why he chose Bhojpuri rather than Hindi songs, Deepak said, “There is much competition in Bollywood and it is beyond my reach, whereas the entry in Bhojpuri industry is relatively easier.” But the desire does not end here. “Once I get established in Bhojpuri industry, I will easily get entry in Bollywood,” he adds. Sanjeevani studio claims to have hosted a number of established Bhojpuri singers like Manoj Tiwari, Pawan Singh and Khesari Lal Yadav. Satish Chauhan from Sanjeevani studio said people from all class and backgrounds come to the studio aspiring to be artists. “We evaluate them ~ whether they can sing ~ and accordingly we choose them as singers. Also there are smaller studios that collaborate with us, providing us songs,” he added. Though Chauhan claims that they don’t accept payment from the artists, there are numerous studios in Delhi that allow singers to record songs of their choice with payments ranging from Rs 3,000 to Rs 4,000 a day. Artists record their songs in smaller studios and approach famous studios for their release. In Narela, on the outskirts of Delhi, Pawan Paswan readies himself for a visit to Badarpur, in another corner of Delhi. Paswan also aspires to be a singer and has already recorded a few songs. He is accompanied by two friends and the trio takes the Metro for Badarpur. On reaching the studio Paswan meets the owner of the studio and has a quick talk on the tune of the music before the recording starts. Paswan looks tense. He has to record four songs before the studio closes. He doesn’t want to get stuck with the tunes since the extra takes will leave him with little time to meet the deadline. The studio is crammed with several artistes waiting to record their songs. The festive season of Holi is a time when the Bhojpuri songs are in high demand. Pawan anxiously gives a take or two but gets out of breath at the end of the sentence. He restarts and tries to sing better. Finally he manages to record his four songs. The desire of stardom and recognition has led many working people like Paswan to continue chasing their dreams. Pawan works in the housing construction sector but utilises his off days and leisure time to become a Bhojpuri singer. Many like Deepak and Pawan have migrated from small towns in Bihar and Uttar Pradesh, leaving behind families, in a bid to turn their ambition into a career. The journey is long but the struggle is even longer. One of the things that make the Bhojpuri music unique is its lyrics. The songs are written for almost every occasion, ranging from love, dream and relationships to festivals, politics and even nationalism. When recently the Indian Air Force carried out air strikes in Pakistan, the industry came out with the song, “Abhinandan ko abhinandan hai, (Welcome to Abhinandan).” This song was in honour of the Indian Air Force pilot, who returned from Pakistan and was celebrated as an icon by the country for his valour. Similarly, when the government implemented its policies like GST or decided to demonetise the currency, the Bhojpuri music industry came up with songs to mark them. 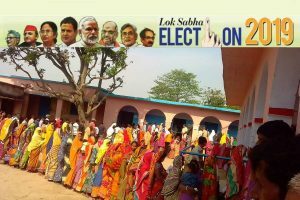 During elections too, songs are made for party campaigns. In short, Bhojpuri music is meant for every occasion.